Portpeek is still actively maintained and has been receiving features and bug fixes. Feel free to open bugs at http://bugs.gentoo.org if you encounter any issues at all. 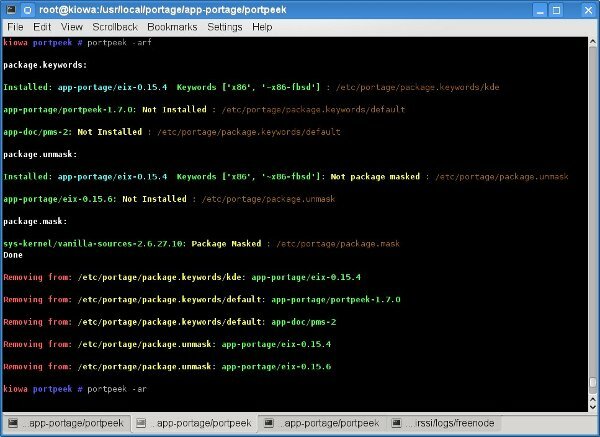 Portpeek is a script for Gentoo users to use to determine if packages the user has in package.keyword or package.unmask have gone stable and can be removed. The script can also remove these unneeded packages automatically. There is an ebuild available from Gentoo’s portage system. Portpeek will now handle the tilde in the package. * files. Remove the use of deprecated portage python modules. Fixed a bug where commented lines were removed when they matched a package being removed. This version has the ability to turn off the color output. It does support the dirs, are you seeing a situation where it’s not traversing into the directories? I’m not sure Is it really related to portpeek but all my files in /etc/portage has been deleted. err… Sorry it’s my fault. I manually removed the entire directory by accident. Could you please add ‘~’ to the list of acceptable atom types. It is quite similar to ‘=’. Here’s why I don’t think ~ will work. Which means he wants every -rX release keyworded for installation. So now let’s say kdelibs-4.2.1-r3 goes stable. Do we remove his line? What if user wants to stay on top of 4.2.1 releases no matter what so when keyworded kdelibs-4.2.1-r4 comes out, he gets it. Please elaborate your thoughts if you think I am completely off base here. 1. Great program, my package.keywords would get really messy without it. 3. Feature request: for folks using package. * sub-directories, could you have it print which file the line in questions is in? Also, have it delete that file if it removes the last line (optional). 4. Bug report: It doesn’t seem to handle packages with blank keywords – I have a line in package.keywords that says x11-plugins/gkacpi * because the package doesn’t have any keywords, but it gets reported in portpeek -ar. I added x11-plugins/gkacpi * but I don’t see it coming up as a problem. Can you open a bug on bugzilla if this is still a problem? any chance to get it to cooperate with paludis? the files in /etc/paludis look very much like the original portage equivalents, so i guess it wouldn’t be terribly complicated to port it, but this is just a wild guess. anyway, that’d be highly appreciated. Could you email me your paludis files? I’ve never seen them before and would like to take a look. portpeek is really very useful… Nice work! I hope to see the latest version in stable as soon as possible. Just a little request: could you add back the no-color option? I use portpeek in a cron script, and those ANSI codes reduce the readability of the output messages. I am missing some functionality. I am using directories which portpeek does not read. It would be a nice feature. I was wondering if you’ve had any progress with paludis support? I could sent you my sample files if you like. I’m sorry. I don’t use paludis. Nice script. I found it by browsing the app-portage category, but whished such a tool existed for a few months. Thank you! I’ve portage-2.1.9.24 installed. Portpeek requires portage-2.1.8.3. @Luis, dependencies should all be sorted out now. I think it is kind of erratum in the script. Please, fix it. This should be fixed in 2.1.16. Please let me know if you still have issues. Python-3.4 is unmasked in stable portage branch. Could you please add USE=”python3_4″ to this package?